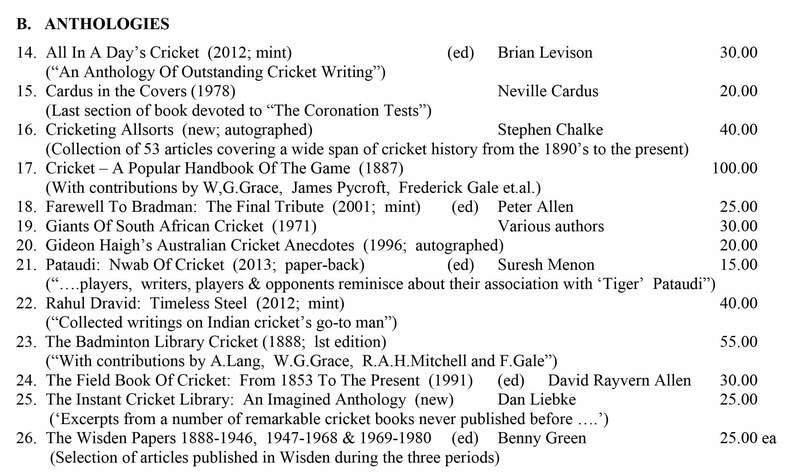 Roger Page Cricket Books has a range of quality cricket anthologies February 2019. We take pride in finding the right cricket book for you. Our collection of well edited cricket anthologies provide much for cricket enthusiasts. They are well compiled collections of writings on the game. There are two categories of cricket anthologies – ‘the best of’ – in the manner of rock star status, and ‘the best among’. We also have a range of cricket publications, collectables. These all feature excellent pieces of cricket writing. There are significant number of quality books in this month’s catalogue listing. If the book is not there, please send me an email or fill out the inquiry form at Contact / Order Roger Page Cricket Books.